Have you ever wanted to work in video games? Well that's what the guys at GameBizCo Inc. do. Literally. Join the cast of Another Videogame Webcomic as we peek behind the curtain to see what exactly goes into bringing your favorite video games to the small screen. It may be a job in video games, but it's still a job. Even though I played Watch Dogs on a last generation system, I was hopeful that the game would be my first foray into next generation gaming. In some respects it was, but in other respects it was all too similar to the games I played in the last generation. Watch Dogs is an open world game where you play was Aiden Pearce, a hacker turned vigilante who is looking for the people responsible for killing his niece in retaliation for a job gone wrong. I guess as motivations go, it's not bad? But there's a huge disconnect between the situation the characters finds themselves in and how they react. For example, someone close to Aiden gets kidnapped through the course of the game, and like in any good kidnapping scenario, the kidnapper allows Aiden to speak with the kidnappee. Except if you take their conversation out of context, you'd never know one of them was being held against their will. It's just weird. The thing I had the most fun with in Watch Dogs was traveling around the city of Chicago. Having been to Chicago many times, I would say the map isn't a 1 to 1 fully realized map of Chicago. I would describe it as Chicago-esque. There are a ton of famous Chicago landmarks you can visit and you can even ride the trains. Highways connect the city proper to the suburbs and there's even a more rural area on the outskirts. There is a ton of stuff to do in the game, but I'd say give this one a "rent". If you're like me and were expecting more hacking than you might be disappointed. But if you look at this game as more of Grand Theft Auto: Cyberspace, than it's right up your alley. 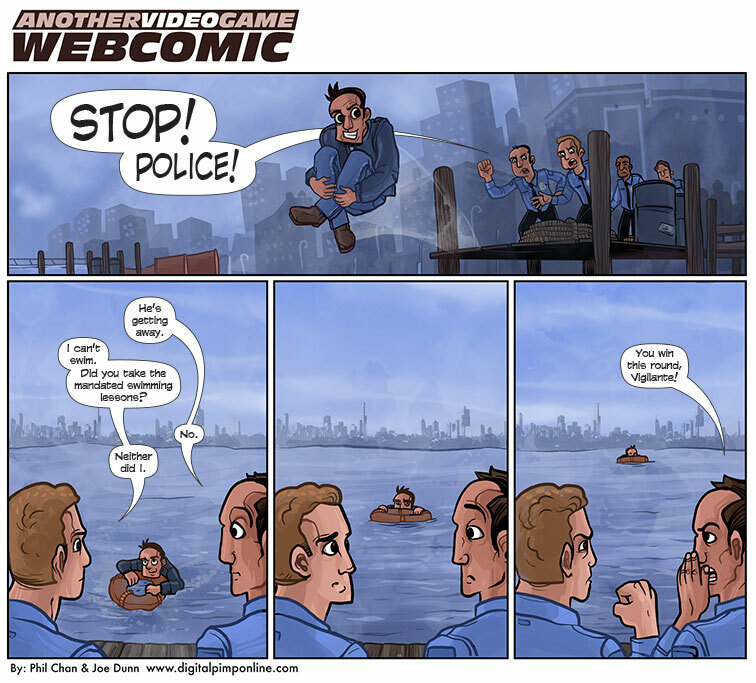 The idea for this comic came about when I found out a lot of the missions where you're being chased by the police or other enemies can be completed by jumping in the nearest body of water and swimming out of their reach. After the resurgence of multiplayer co-op, GameBizCo Inc. hired Player Two to be the Goose to someone else's Maverick. His workload isn't quite as heavy as most of the other people working at GameBizCo Inc. and as a result, he spends a lot of time in the break room or playing computer solitaire. Player One is top dog at GameBizCo Inc. Nearly every game, from Pong to Mario Bros to Grand Theft Auto, requires Player One's expertise. His cocksure and sometimes inappropriate attitude is an annoyance to his coworkers but seeing as every game needs a first player, they make due. First Appearance: Bonus Stage! Here comes Player One! Whether it be a castle, a dungeon or mystical island, Damsel always needs to be saved... and she hates it. Damsel longs for the day when she's given the role of a strong female lead character who doesn't have huge breasts with hyper accurate physics. Underneath the huge brute that is Final Boss lies a timid creature who wouldn't hurt a fly. He puts on his "angry face" when throwing barrels down ramps or breathing fire but deep down he feels sorry for doing so. He's been known to throw a game or two in the player's favor. John Minion, or Min for short, is the hardest working employee at GameBizCo Inc. Playing everything from Goombas to no name thugs, Min gets beat up on a daily basis but loves every minute of it. He always wanted to work in the gaming industry and was originally hired as an intern. After years of getting coffee, his big break came when someone called in sick... and the rest is history. Middle Manager works in the Human Resources department. He runs staff meetings and interviews prospective employees. The other 90% of his time is spent playing Freecell on his computer.